I was given the Julius Pettersson Blade for Christmas by my wife a couple of years ago, and I’ve finally gotten around to putting a proper handle on! I’ve made one or two other knives in a similar style, but this one is my favourite! 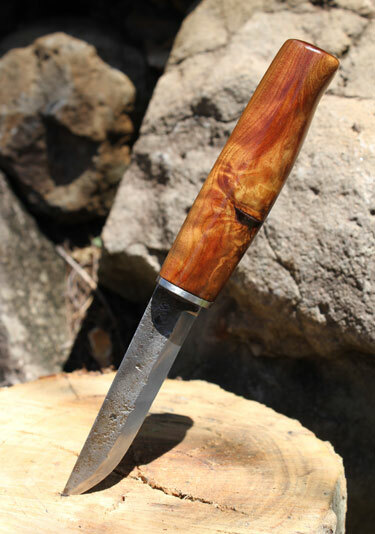 The handle is a stainless steel bolster, and the wood is Australian Cypress Pine. I’ve almost finished the sheath, which is made of 2 mm veg-tanned leather. The wood just flames in the sun when it’s been oiled, so good. Anyway, hopefully I’ve done this awesome blade justice. This entry was posted in Bushcraft Clothing & Equipment, Customer Posts on December 6, 2010 by Woodlore Team. Love the simple lines of this handle, and the beautiful grain in the wood. Really beautiful piece! I too have been a fan of Ray’s since the days of ‘Country Tracks’ on BBC2. What kind of metal bolster was used at the top of the handle? Lovely bit of work Graham. Looks like a sweet little user. Great work Graham, the wood is beautiful. Stunning Australian Cypress Pine. The colours and figuring are really nice. Really nice work. Beautiful handle and blade combination. I like the simplicity.